Grossly Underseeded: VCU, #7, 26-9. If you’re not in a Power Five conference, sometimes it must seem like you just can’t win. The committee claims that it puts an emphasis on having a strong schedule. The Rams have an RPI of #15 and their strength of schedule is #15. They’ve played 22 games against teams with a top 100 RPI and they’ve won 14 of those games. They played six teams in the non-conference that ended up in the NCAA Tournament. Sure, they stumbled a bit down the stretch of the regular season, losing three of their last four and five of their last 10 after senior Briante Weber tore his ACL. But then all they did was win the Atlantic 10 Tournament, convincingly. The Selection Committee deserves to be scolded for its continued shoddy treatment of non-power conference schools. Sweet Sixteen Sleeper (#12 seed or lower): Georgia State, #14, 26-9. The Panthers have a case for that whole grossly underseeded title as well, but maybe the committee knocked them down a slot or two after head coach Ron Hunter tore his Achilles while celebrating his team’s Sun Belt title on Sunday. In all seriousness, with talented veterans like Ryan Harrow (yes, the former N.C. State and Kentucky guard still has eligibility), Kevin Ware (formerly of a gruesome leg injury while at Louisville) and R.J. Hunter (considered a borderline first-round NBA Draft Pick should he forgo his final season of collegiate eligibility), there is plenty of talent here. They looked foolish back on November 17 in a 23-point loss at Iowa State in their only game against a team in the NCAA Tournament field, but this team can score enough to keep things interesting. Final Four Sleeper (#4 seed or lower): North Carolina, #4, 24-11. Calling the Tar Heels, one of the most successful college basketball programs of all-time, a sleeper feels like cheating. But, in a region where Wisconsin and Arizona are going to get the most publicity, Roy Williams’ talented bunch could throw a wrench into some of those well-laid plans. They’ve got a talented and deep frontcourt with Brice Johnson, Kennedy Meeks and Isaiah Hicks forming a strong big man trio. Junior J.P. Tokoto is a versatile defender and transition nightmare. And preseason All-American guard Marcus Paige really turned it on down the home stretch after an underwhelming non-conference performance. But the key for this team may be freshman Justin Jackson. On a team lacking a ton of great perimeter shooters, Jackson is a better shooter than his 27.1 percent three-point marksmanship suggests. If he can knock in shots like he did in the ACC Tournament semifinals against Virginia, the Tar Heels can beat just about anybody. Carmelo Anthony Award. 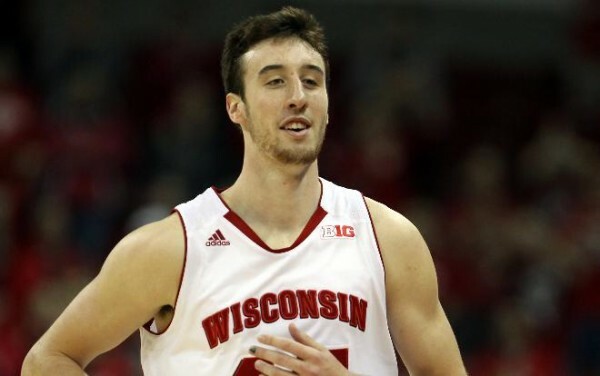 Frank Kaminsky, Wisconsin (18.2 PPG, 8.1 RPG, 59.6% eFG) – There’s a chance that Kaminsky doesn’t wind up as the National Player of the Year, but it isn’t a very good one. He’s a complete offensive player, having scored 20 or more points in a game 13 times this season (and only once in single figures). He shoots the ball at 38.5 percent from three and 59.6 percent from two. He’s a brilliant screener; he passes well; he’s terrific moving without the ball; he’s a good defender; he cleans the defensive glass with abandon. And he’s just an all-around likable character in the world of college sports. On a team with plenty of other options built to spread the scoring around, you’re not going to often see Kaminsky blow up for a 30-something point night. But he’s plenty capable of it. Stephen Curry Award. 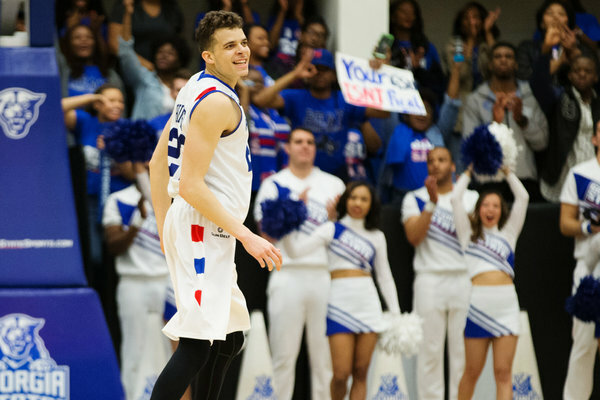 R.J. Hunter, Georgia State (20.1 PPG, 4.8 RPG, 3.8 APG, 88.3% FT) – Hunter can often be a feast or famine scorer. For proof of that notion, just look at his four games in March — he twice scored just nine points in a game on a combined 6-of-26 from the field. In the other two games, he averaged 33.5 PPG on a 67.5 percente true shooting rate. Oh, and in those latter two games, he also averaged five steals per outing. When things are going good, Hunter has the ability to put the team on his back and carry them to a win. When things are going poorly, he has the ability to shoot his team right out of contention. Home Cooking: Arizona, #2, it doesn’t matter how many miles – Wisconsin is the #1 seed but Arizona got the favorable geography. You see, Wildcats’ fans will travel just about anywhere to watch their team play. Traveling to big cities within the Pac-12’s geographical footprint? That’s a given. When Arizona plays in Portland this weekend, the Wildcats will have a home game at the Rose Garden. When they play at the Staples Center next weekend, Los Angeles will be overrun with U-of-A chants. This is why Arizona fans didn’t really care about whether they got a #1 or a #2 seed; a Portland –> Los Angeles path to the Final Four was the top priority. Can’t Miss Second Round Game: VCU vs. Ohio State, 3/19. 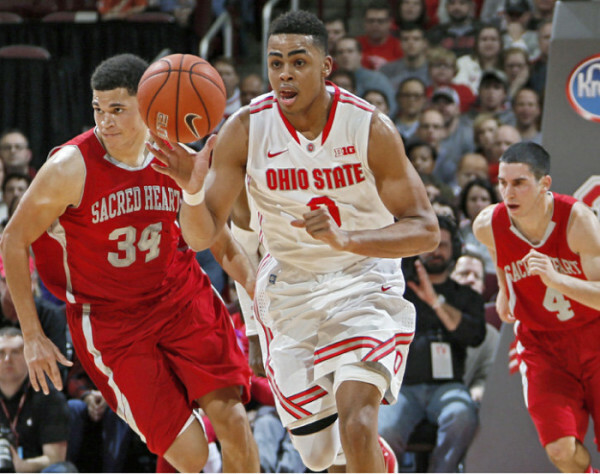 The Buckeyes’ freshman guard D’Angelo Russell has been appointment viewing all season long. A visionary player capable of scoring inside and out, dropping beautiful dimes, rebounding alongside frontcourt players and making astounding defensive plays, he’s got a bright future ahead of him in basketball. On Thursday, he’ll face the challenge of VCU’s havoc defense. If he can successfully navigate that pressure, there could be abundant chances for highlight-reel plays, with guys like Sam Thompson and Marc Loving on the receiving ends of his passes. If the Rams’ defense can slow Russell, however, they can extend their winning streak. Don’t Miss This One Either: Arkansas vs. Wofford, 3/19. – A clash of styles is always fun. The Razorbacks want to get up and down the floor (they’ve got the eighth-quickest average offensive possession length in Division I); Wofford wants to slow it down and grind it out. The Hogs are big and athletic along the front line; the Terriers don’t have a player taller than 6’7”. If Wofford can get some threes to fall from guys like Karl Cochran (90 threes at 36.9%), Spencer Collins (37 threes at 37.8%), Eric Garcia (31 threes at 38.8%) and Jaylen Allen (33 threes at 38.8%), they’ve got a good chance to spring the upset. Just ask North Carolina State, which the Terriers beat back in December. Lock of the Year: Arizona/Wisconsin rematch. Both the Badgers and the Wildcats have what look like tough Sweet Sixteen challenges in North Carolina and Baylor, respectively. But in both of those cases, the favorites have good matchups. Baylor needs to be able to win on the offensive boards to beat good teams, and the Wildcats will not let that happen. Meanwhile, if North Carolina can’t get out into transition, which the Badgers probably won’t let them do, they’re going to struggle offensively. And, there’s this: The basketball gods are gonna give us this Elite Eight rematch, aren’t they? Juiciest Potential Matchup – purists: Arkansas/North Carolina, round of 32. I already told you about Arizona/Wisconsin, and that is plenty juicy. But, in the interest of highlighting something else, let’s put these two teams together on the first weekend. The Razorbacks are ninth in the nation in adjusted tempo, ending their average offensive possession in 15.7 seconds. The Tar Heels are 10th in tempo, using a whole 16 seconds on their average possession. If things go just right, we could be treated to an up-and-down game that could remind us of the fast-breaking, free-wheeling style of years gone by. 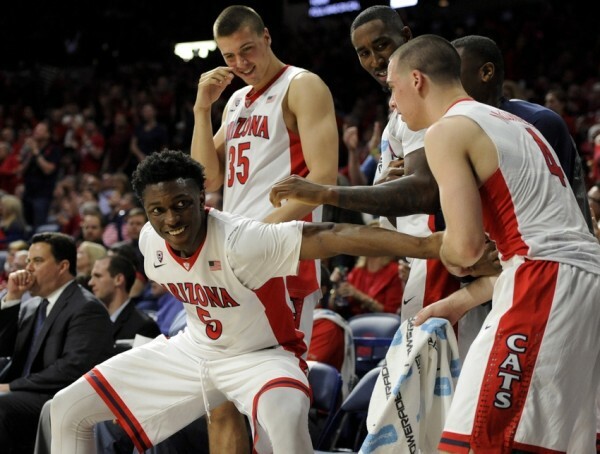 Juiciest Potential Matchup – media: Arizona vs. Ohio State, round of 32. Sean Miller vs. Thad Matta in the NCAA, Part III? Miller and Matta served as assistants together at Miami (OH) and later, when Matta got the head coaching job at Xavier, he hired Miller as his primary assistant. They remain friends, but they’ve been forced to clash in the NCAA Tournament twice already. In the first, Ohio State and Greg Oden came back from a late nine-point deficit to knock off Miller’s upset-minded Xavier team back in 2007, when a Ron Lewis three with two seconds remaining forced overtime. Matta upped his advantage to 2-0 by knocking off Arizona in 2013 when LaQuinton Ross hit a three, again with two seconds left, to win the game in regulation. If they meet again in the round of 32, Miller will be a heavy favorite to earn his first win against his good friend. We Got Screwed: BYU and Ole Miss, play-in game. Getting sent to Dayton to have to earn your way into the main bracket is tough enough, but after tipping at approximately 9:10 pm ET on Tuesday night, the winner of this game will have to turn right around and get to Jacksonville in time to play Xavier on Thursday at approximately 4:10 pm ET. That’s one hell of a road trip. Strongest Pod: North Carolina/Harvard, Arkansas/Wofford. Those #4/#13 and #5/#12 games are always upset possibilities. And the #12 and the #13 here are teams capable of springing upsets by keeping their opponents out of their preferred style of play. The Crimson have already shown that they can win big NCAA Tournament games, as they proved against New Mexico two seasons ago in Salt Lake City, with three major contributors on this current team – Wesley Saunders, Siyani Chambers and Steve Moundou-Missi veterans of that stirring upset. As a #12 seed last year, the Crimson turned the trick again versus Cincinnati. And while Wofford is still oh-for-history in its three NCAA Tournament chances, they have the experience of losing to Michigan last year in their back pocket. Against an Arkansas program that hasn’t been to the Big Dance since 2008, the Terriers are the more experienced team here. Wildcard: Triple-Double Time. Now, we haven’t talked a whole lot about BYU yet, but if you haven’t taken the time to watch the Cougars this season, it is worth your while to search them out when they play Mississippi on Tuesday night. 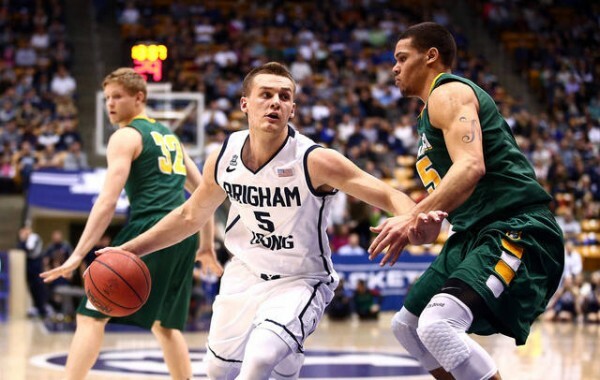 Junior point guard Kyle Collinsworth recorded his sixth triple-double of the season last week at the West Coast Tournament, equaling Shaquille O’Neal’s career mark and the NCAA’s career record. A high-energy guy, he gets into the paint seemingly with ease, and then is capable of scoring there or finding any number of teammates for clean looks. And then there’s senior guard Tyler Haws, one of the best scorers in the country. With teammates picking up their offense, Haws’ per-game average dipped from 23.2 PPG last year to “just” 21.9 PPG this season. But he’s a guy who can score from all three ranges and get to the free throw line with great regularity as well. While the Cougars are not a great defensive team, they can simply outscore opponents when they get on a roll. Ole Miss should be concerned, as should potential round of 64 opponent, Xavier. So-Called Experts: CBS Sports’ Sam Vecenie says that uptempo teams like North Carolina and Arkansas could cause problems for Wisconsin, while Baylor’s zone could throw a wrench in Arizona’s Elite Eight plans. Jeff Goodman of ESPN is more on board with the idea that Wisconsin and Arizona have significant advantages over those potential opponents. Mike DeCourcy of The Sporting News thinks Wisconsin and Arizona got the shaft, somehow, because Villanova, which doesn’t have the bad losses that the ‘Cats and Badgers have compiled, got the second overall #1 seed instead. This entry was posted on Tuesday, March 17th, 2015 at 12:01 pm by Andrew Murawa	and is filed under 2015 ncaa tournament, bracket prep. Tagged: arizona, arkansas, Brandon Ashley, brice johnson, bronson koenig, byu, D'Angelo Russell, feature, First Four, frank kaminsky, georgia state, harvard, isaiah hicks, J.P. Tokoto, justin jackson, Karl Cochran, Kennedy Meeks, kevin ware, kyle collinsworth, marcus paige, Nigel Hayes, north carolina, ohio state, oklahoma state, ole miss, r.j. hunter, ron hunter, rondae hollis-jefferson, roy williams, ryan harrow, sam dekker, Stanley Johnson, t.j. mcconnell, traevon jackson, tyler haws, vcu, wisconsin, wofford. You can follow any responses to this entry through the RSS 2.0 feed. You can leave a response, or trackback from your own site.